BATMAN: YEAR ONE Animated Film Footage Arrives! Batman: Year One remains my favorite comic book story of all time and now, after much anticipation, we’ve got a first look at the upcoming animated adaptation starring Ben McKenzie (Batman/Bruce Wayne), Bryan Cranston (James Gordon), Eliza Dushku (Selina Kyle/Catwoman), Katee Sackhoff (Sarah Essen) and Alex Rocco (Carmine Falcone). 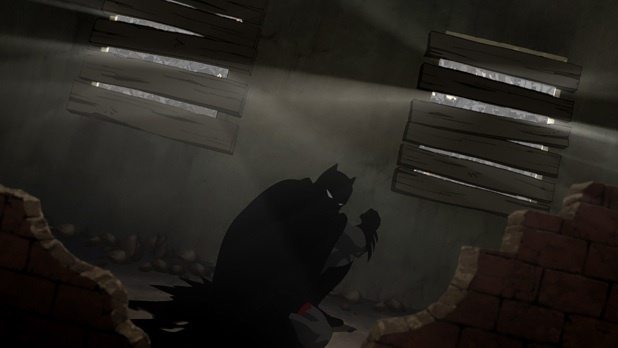 Although elements of the story have appeared in other films, Batman: Year One tells the parallel story of Bruce Wayne returning to Gotham after years abroad and developing the methodology to fight crime in Gotham with the arrival of James Gordon, the lone cop trying to make a difference in a city filled with corruption, juggling a pregnant wife and a tainted reputation. The film is co-directed by Sam Liu and Lauren Montgomery and is written by Tab Murphy and based on the graphic novel by Frank Miller and David Mazzucchelli.